Something tells me that this plant has been neglected. 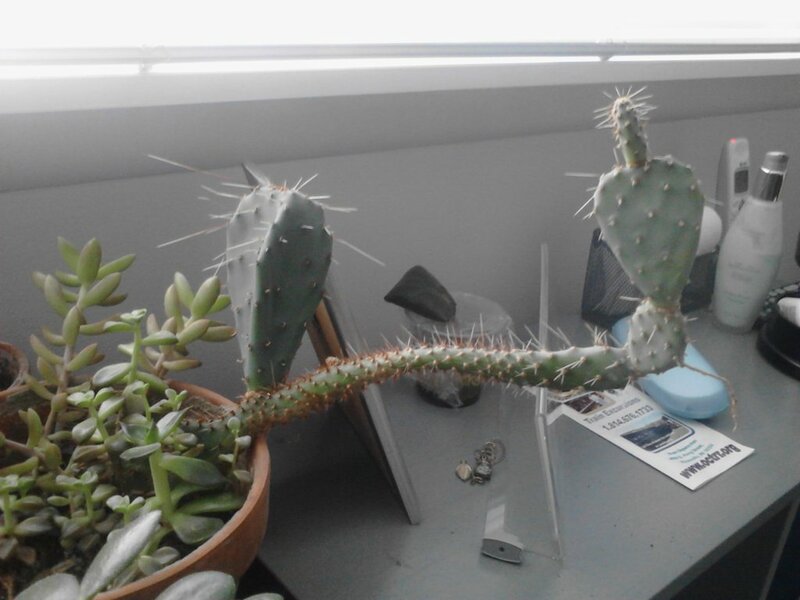 Of course, cacti are naturally prickly. If you want a friend, get a geranium. well, there’s a prickly s o b. Give it up guys, the plant is just trying to survive and fighting for its space. Looks as if its neighbor has overtaken the pot. I wish I had the terrific imagination that some of you have! I’m betting on the cactus to survive. The plant world manages fairly well at living side by side,. It’s called “Survival of the fittest”. Thank you all, I needed a good laugh. Yep but they call ’em feelers. I guess plants do have feelings. Maybe if congress sat on this they would wake up an reign in a runaway president! That would make a great avatar for me on Monday mornings. Wonder if it would demand royalties or residuals? The resolve of this plant is to be appreciated. From its germination, it learned of its subjugation by a master who wished only to confine it to a pot, for purposes only to serve as entertainment and the transient pleasures of guests he chose to entertain at the expense of the cactus’ liberty. Deprived of a voice or ability to rebel it mustered much of its life to convey a fitting gesture toward a vain master and afronting those who gawk at its disposition. After years of singular purpose, some believed it could have grown to be an inspiration for other cacti. That is, a beauty only other cacti know. It instead chose an all out effort to stand for what it believed in. Its a message that has so undeniably come to fruition. It was certainly by no accident, but by a will commanding respect, despite its crudeness. And/or how foreign policy evolved. The Maricopa County cacti (maricopus extendus).